GGoing round and round is a way of life for Earth, Planetary, and Space Sciences (EPSS) professor Jon Aurnou. His Simulated Planetary Interiors Laboratory —SPINLab—studies how the rotation of planets shapes the flow of fluids in their atmospheres and cores. 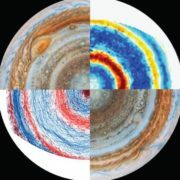 By investigating fluid dynamics with state-of-the-art devices and numerical simulations, the SPINLab team interpret magnetic fields and jet systems on gas planets. Most recently, they used of an enormous spinning garbage can to simulate the wind patterns of Jupiter’s atmosphere (read more about that here). Earth’s rotation impacts our day-to-day weather, as SPINLab demonstrations have shown on its YouTube channel, which recently topped 100,000 views, and via hands-on demonstrations at UCLA’s annual Exploring Your Universe public science education and outreach event. Even better would be to have the ability to take these hands-on experiences off campus and into local school classrooms. To this end, Aurnou has been collaborating over the past two years with Juan Lora and Spencer Hill, two National Science Foundation (NSF) postdoctoral fellows at UCLA. Hill and Lora spearheaded the development of a new outreach program that brings rotating tanks of water into classrooms where kids can get their feet (hands, actually) wet as an introduction to atmospheric motions and planetary climate. Thus DIYnamics was born. The presentations taken to schools are the result of more than a year of design and testing. The rotating tank design was perfected by EPSS undergraduate Norris Khoo, who combined a Lazy Susan and a Lego motor system to create a broadly functional rotating table that costs less than $50. 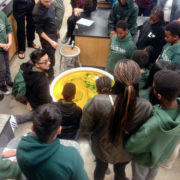 The group also created instructions, demonstrations, and a teaching module, all meant to encourage middle school students and their teachers to experiment with geophysical fluid dynamics on their own. DIYnamics, which hopes to keep growing every year, was piloted in 2017 with eight groups of 7th and 8th graders, reaching 200 students over three days at La Tijera K–8 School in Inglewood and Ralph J. Bunche Middle School in Compton. Each session started with a quick introduction of planetary fluids through images and videos, augmented by hands-on demonstrations using gyroscopes and globes, and an explanation of the use of rotating tanks of water as scientific models for planetary atmospheres and interiors. With the guidance of the DIYnamics volunteer students and staff from EPSS and UCLA’s Department of Atmospheric & Oceanic Sciences (AOS), the middle and elementary school students engaged with a range of rotating experiments: tanks on Lazy Susans, a one-meter diameter shallow tank nicknamed “the White Whale,” and a deeper half-meter tank outfitted with a camera to project images of the experiment on the classroom wall. Thanks to the fun of splashing around with water and food coloring, students were excited to learn more about this fascinating aspect of planetary science, while teachers and parents welcomed a new and innovative way of fostering appreciation for science in young students. 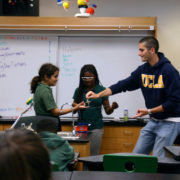 Educators who are looking for an engaging new science presentation for their classrooms may contact the team by visiting their website [https://diynamics.github.io] and YouTube channel [tinyurl.com/diynamicsvideos], which features step-by-step instructional videos on assembling your own affordable, accessible Earth science demonstration and teaching materials (with downloadable instruction sheets also available). DIYnamics members and volunteers during visit to La Tijera K–8 School. From left to right: EPSS graduate students Sean Faulk and Ashley Schoenfeld; UCLA undergraduates Alex Arnold and Ellen Hoppe; La Tijera science teacher Dr. Maurice Stephenson; and postdoctoral fellows Juan Lora and Spencer Hill.